Forest City Fashionista: Viva L'Italia! I was very lucky in the timing of my recent trip to Portland, Oregon in that I was able to catch the wonderful exhibit Italian Style: Fashion Since 1945 at the Portland Art Museum just before it closed. The exhibit, curated by Sonnet Stanfill (what a glorious name) at the Victoria and Albert Museum in London, is the first collection of high fashion to be shown at the Portland Art Museum. The exhibit, which tells the story of the creation, and evolution of Italy's fashion industry, is full of breath-takingly beautiful clothes that inspired multiple outbursts of "Oh My God - Look at this!!!" The exhibit contains over 150 pieces, and is organized by time period. The main floor room (in the photo above) features a t-shaped runway populated with couture fashions from well-known Italian design houses like Valentino, Dolce and Gabbana, Marni, and Prada. As with many museum exhibits I have posted about in the past, there were no photos allowed. 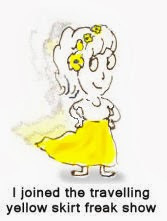 But did that stop this intrepid blogger? However, if any staff at the Portland Art Museum read this, it may not only be the first, but also the last exhibit I get to see there. 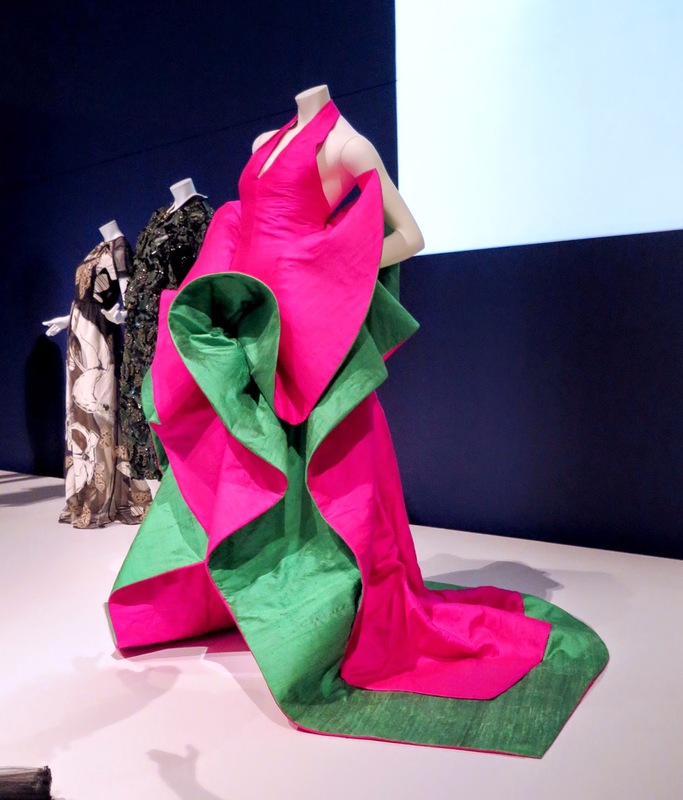 If I could have one dress from the runway display, it would be this sculptural beauty from 1987, designed by Roberto Cappuci, The colour combination is one of my favourites, and the giant ruffles suggest a ridiculously extravagant flamenco dress. I wasn't familiar with this designer, but after seeing his pieces in this exhibit, I'm a big fan - just do a google search for images of his designs and you'll see what I mean. Left: A stunning silk tulle and net gown by Valentino from 2001 Right: closeup of the criss-cross pattern of over-size beadwork on the dress. The simple shape of the Marni jacket and skirt on the left from 2014 is counterbalanced by the explosion of beads and sequins that cover both pieces from collar to hem. 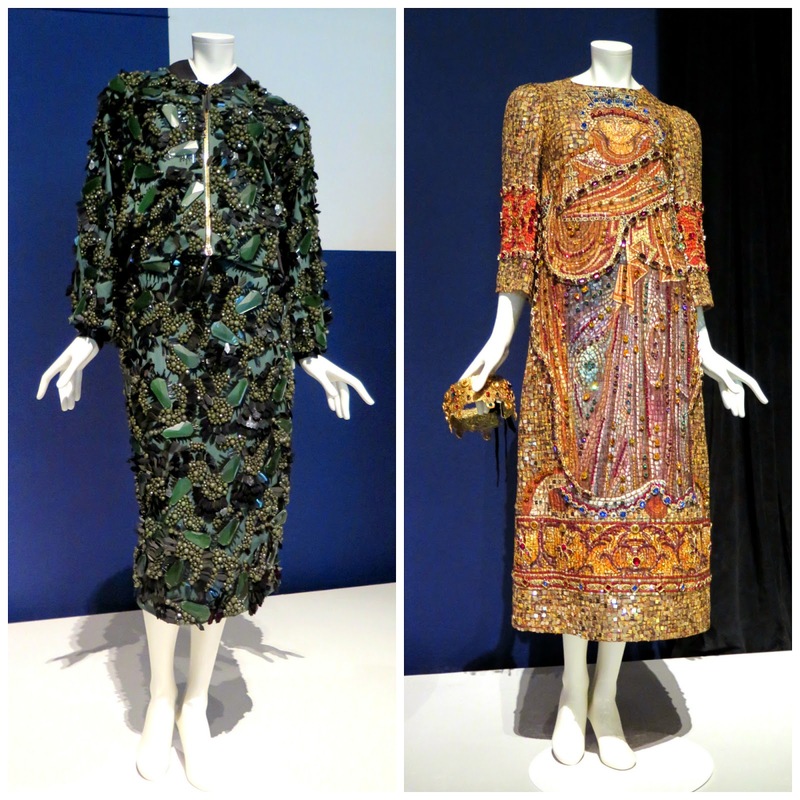 The dress on the right, by Dolce and Gabbana, features images of mosaics from Sicily's Cathedral of Monreale. 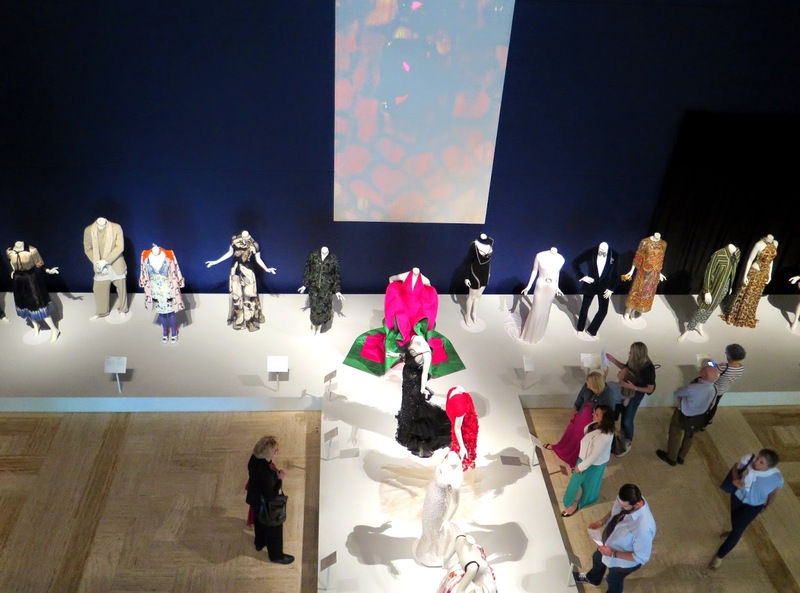 The exhibits on the second floor were organized by time period, from the 50's to the 80's, and featured displays devoted to accessories, tailoring, ready-to-wear and the impact of Hollywood films on Italian fashion. After World War II, the United States created the Marshall Plan, named after U.S. Secretary of State, George Marshall, which was designed to help re-build the economies of war-destroyed Europe. 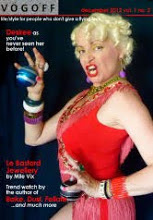 The Fashion industry gained a sizeable benefit from the end of the war both in the U.S. and Europe - prior to WWII, wealthy people who wanted designer clothing acquired it from Paris. After the war, there was a new market in the United States for more casual, affordable, and easy-to-wear clothing. While French fashion was focused on couture, Italian design was geared towards casual, elegant functionality, which was what American women were looking for. 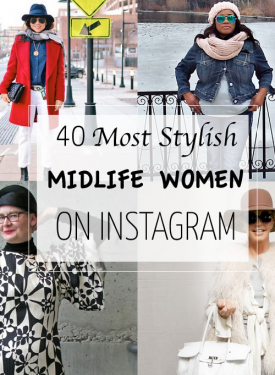 Designers like Missoni and Emilio Pucci were especially adept at creating this type of clothing. This Emilio Pucci tribute window is in the stairwell between the first and second floor of the Museum, and features a detail from his 1965 "Dalia" print. Pucci had a Portland connection - the former Olympic skier came to ski on Mount Hood in Portland, and when the upheaval in Europe cut off access to his income, he persuaded the President of Reed College to provide him with tuition and accommodations, and in return Pucci formed Reed's first Ski Team. When Pucci designed modern uniforms for the team, he invited a film crew to film them in action. 11 years later, photographs of skiers wearing his designs were published in Harper's Bazaar, and his design career was launched. One of the exhibit rooms was designed to simulate the famous "Sala Bianca" catwalk shows that were held in Florence in the 1950's. The first of these shows was held in 1951, and was organized by Giovan Battista Giorgini, an Italian importer for American goods, who saw that there was a market to be tapped, and began to organize, and encourage Italian designers to create their own affordable style. The first show featured such designers as Emilio Pucci, Simonetta and Roberto Capucci. Film footage of one of the Sala Bianca shows played on a television screen in the room and enlarged photographs from the shows were displayed on the wall. 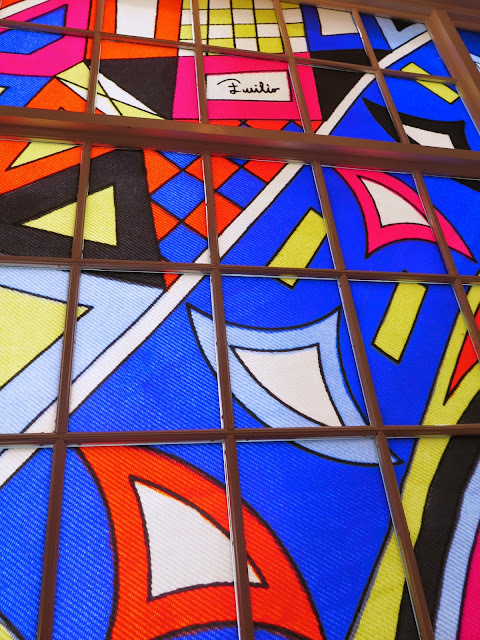 Pucci launched his first beachwear line in 1949. The cotton beach tunic and shorts outfit above, in a print called "Azteco", is a design from 1951. The bold pattern and streamlined shape is completely wearable today - I would wear it with a pair of colourful Converse. Another sculptural piece from Roberto Capucci, from 1957. He became known for the dramatic shapes of his designs, of which this dress and velvet stole is a perfect example. 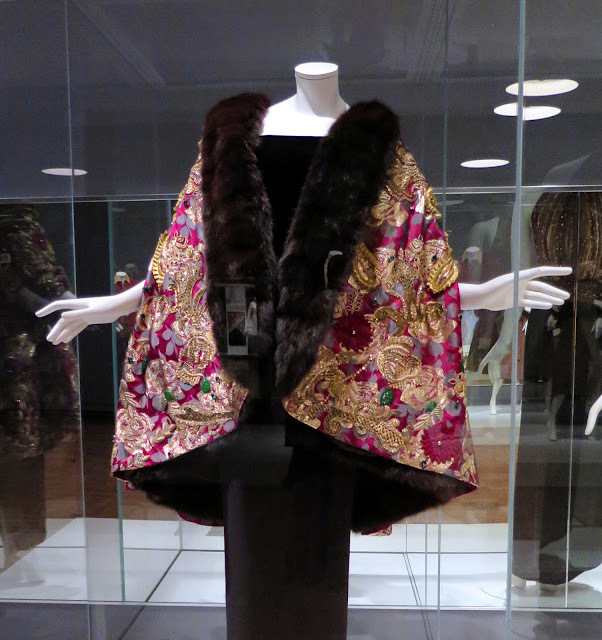 Judging by the pieces displayed in this exhibit, I would say that he was not so much creating clothing that flattered the shape of a woman's body (although this one would certainly create a very exaggerated hour glass shape) so much as transform it into a walking work of art. 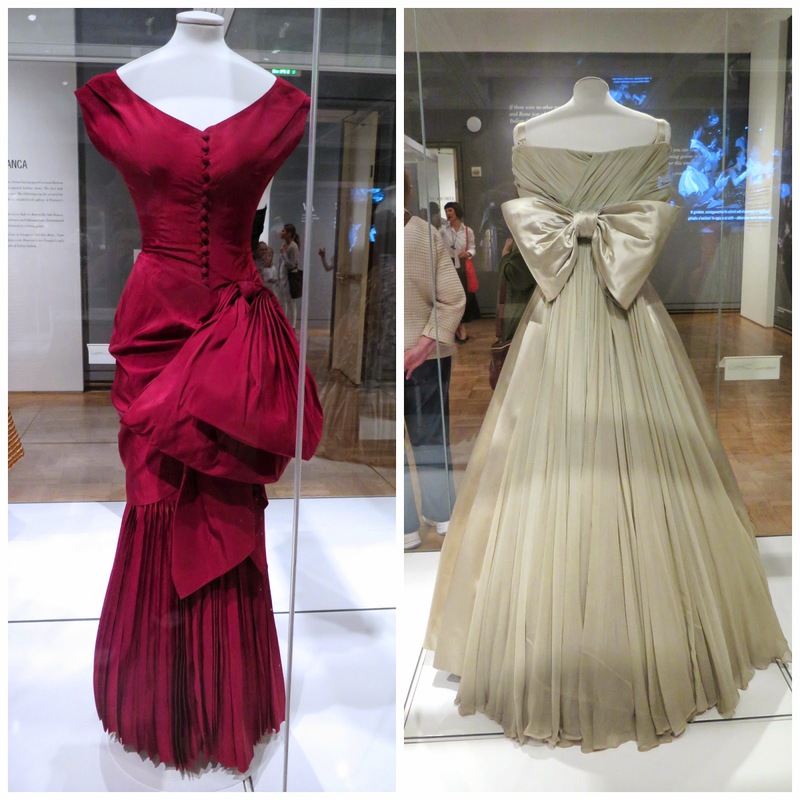 The exquisitely draped dress on the left was made by Germana Marucelli in 1950. She was known as the "Cerebral Seamstress" because of her literary and cultural pursuits in addition to her sewing skills. I neglected to note the year or designer of the one on the right, but the gathered back detail is gorgeous. 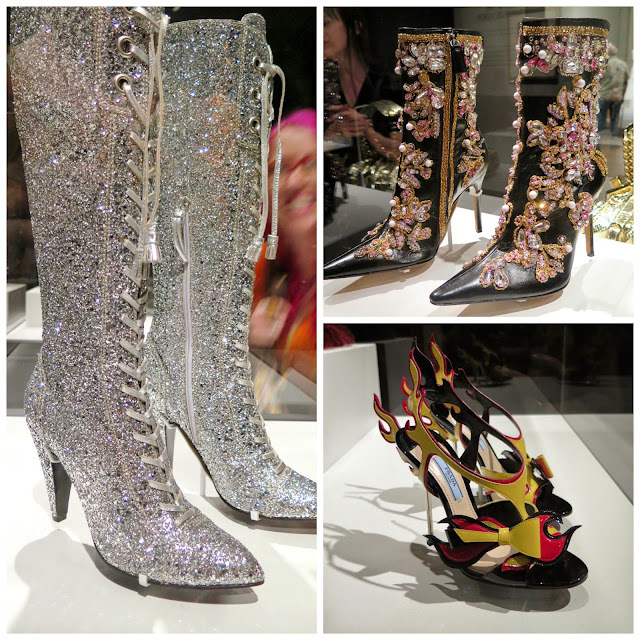 The Italians do know their accessories and the exhibit has several examples of exquisite footwear. The silver glitter boots on the left are Miu Miu, the gem-encrusted ankle boots are Dolce and Gabbana from 2000, and Prada's 1950's car-inspired, flame-detailed sandals from 2012 are on the bottom right. 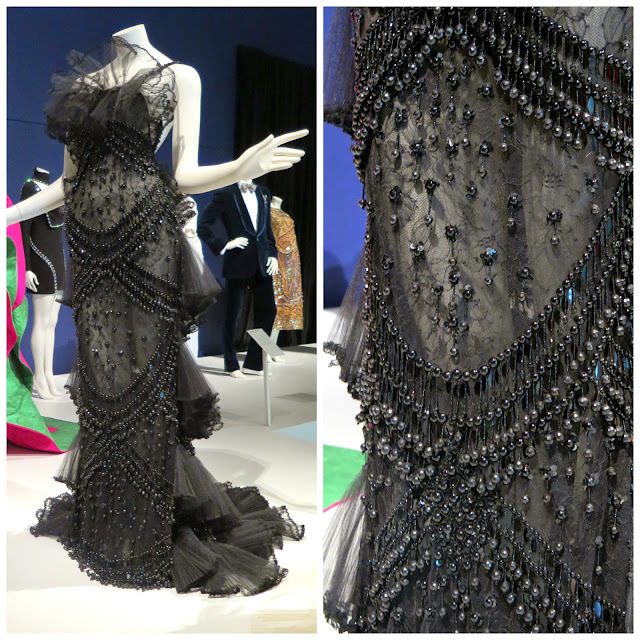 One section of the exhibit was devoted to the relationship between Hollywood and Italian fashion. By the late 1950's, American studios were producing big-budget movies in Rome, and Italy became the vacation spot for movie stars. Elizabeth Taylor was one of the first actresses to wear Valentino's designs, which she discovered while in Rome shooting Cleopatra. The 1960's film "La Dolce Vita" brought Italian style into the popular culture, and influenced the tailoring of men's wear in the United States. The security guard in this section of the exhibit was pretty vigilant and unfortunately, I wasn't able to get any photos. 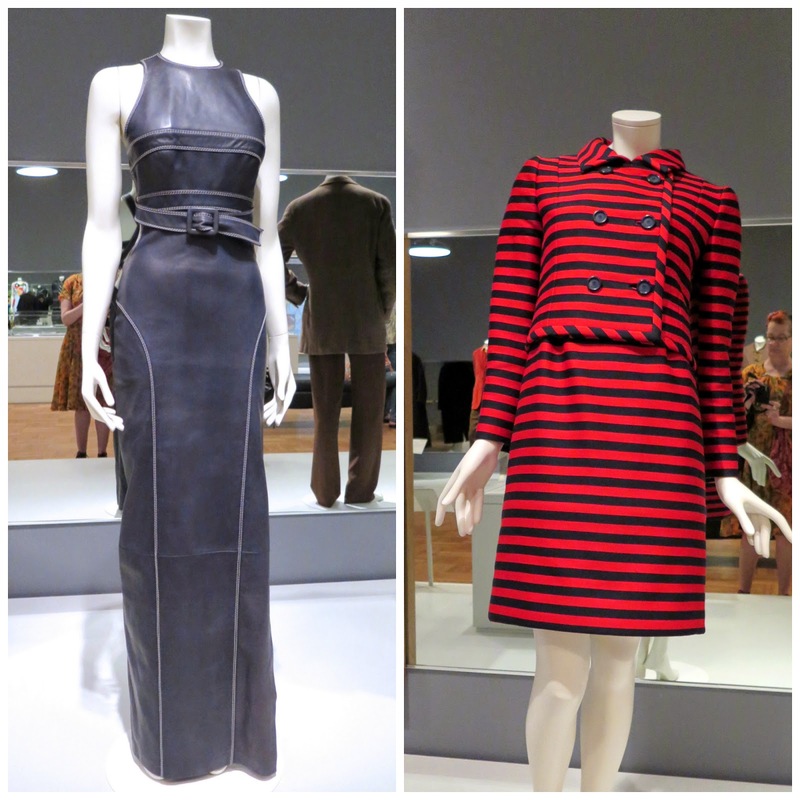 The leather evening dress on the left was from 1993, and designed by Nicole Trussardi. The 30 year old me would have killed to have this in my closet. 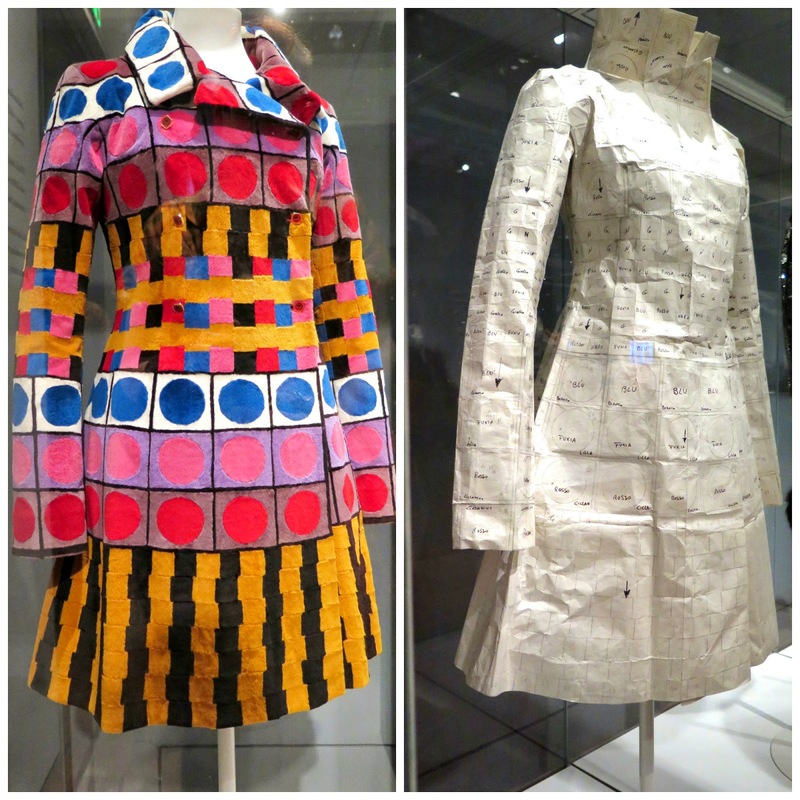 The striped suit on the right was designed by Alberto Fabiani in 1967. The couture quality of the design is evident in the care that was taken to match the stripes on the arms right across the jacket and the skirt so that your eye moved across the torso with no interruptions. Italy's ready-to-wear market was booming in the 1980's but there were still luxury couture pieces being made. This gorgeous Gianfranco Ferre embroidered evening coat from 1988 is a blend of wool, silk and lurex, trimmed with sable. 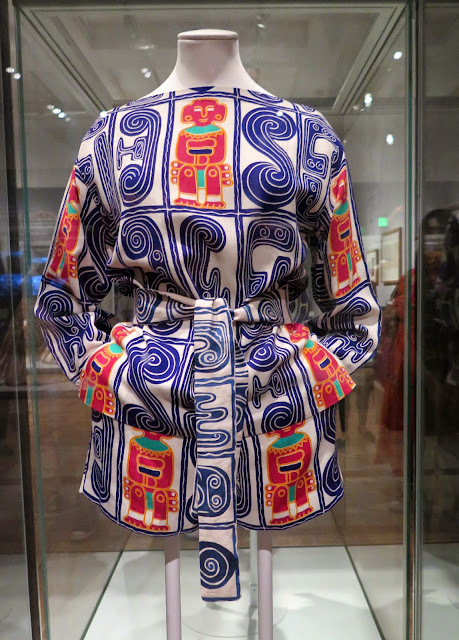 I'll leave you with this spectacular piece of eye candy - to look at this colourful Fendi coat you wouldn't know it was made of fur, but it is in fact, a jigsaw puzzle of sheared, cut and dyed segments of mink. The paper pattern on the right shows the planning that designer Karl Lagerfeld put into the design. Clothing, or Art? You decide. The Portland Art Museum was the only west coast venue for this exhibit. 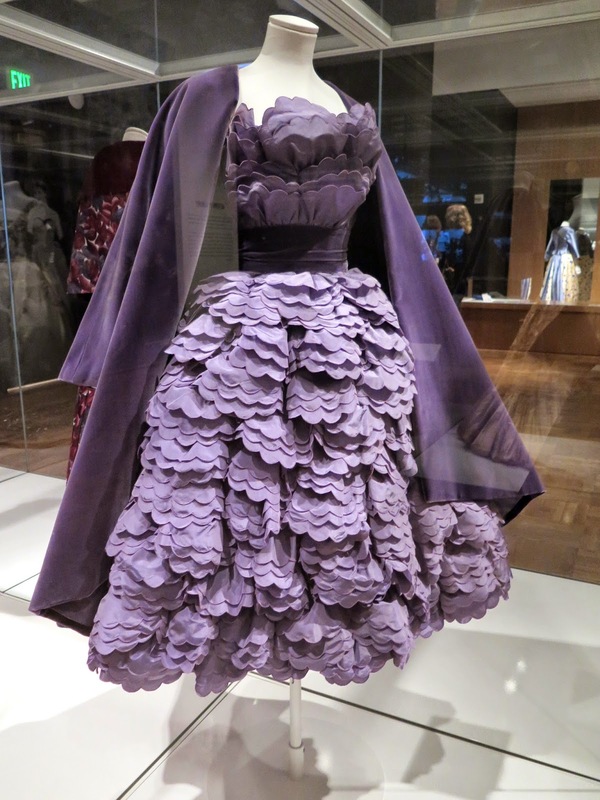 I loved it, not only for the spectacular eye candy, but for the educational aspect - I knew nothing about the Italian fashion industry prior to seeing this exhibit, and it's a fascinating story. If it comes to a venue near you, go see it!! Thank you for being sneaky. The clothes are amazing. I do love the paper pattern for the fur coat! Wow! Thanks for daring to take photos! What a fabulous exhibit. So many jaw dropping pieces. You were very, very bad to take photos without permission. We applaud your very very badness, and we also thank you for your sneakiness. You go, girl! Wow, so much goodness here - thank you for sneaking photos for us! I treasure my Gianfranco Ferre skirt and my Dolce & Gabbana skirt. Wow! Beautiful clothing and I secretly love Karl Lagerfeld, he's absolutely bonkers but a complete genius with fabric! Thanks for breaking the rules just to share! such a fabulous exhibition of art!, glad you enjoyed it! I should wear many of the pieces (even the amazing pink and green dress which appealed you too!) but I'm particularly in love with the striped suit!, and all those embroideries and details!, and that Fendi coat is a Dream!! Your illicit affair with Italian design. Such beautiful pieces. No wonder you were seduced. How on earth did you get such great photos indoors? No blur, no glare. And you did it all on the sly. I could never have even thought of it. Yes, there are a few beauties I wouldn't mind having in my closet!